MEEKER I Pioneers Medical Center and Channel 9 TV in Denver will host the annual 9Health Fair on Saturday from 7 a.m. to 11 a.m. at Meeker Elementary School, where a series of low-cost screenings and tests and free health checks will be offered to those attending. The 9Health Fair is a community partnership with 9Health Fair, the Rio Blanco Fire Protection District, Pioneers Medical Center and the Meeker’s Lions Club. Free and low-cost health screenings along with education on health information will all be available at Meeker Elementary School. 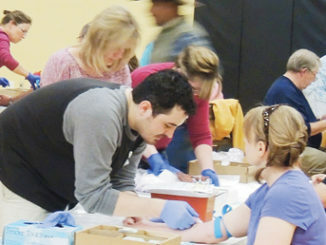 Participants can also access free screenings such as vision, blood pressure and more. An optional screening is a blood cell count that measures four major components: white blood count, hemoglobin concentration, hematocrit value and platelet count. You can find out what your ideal numbers are for glucose, cholesterol and blood pressure, which are the three key numbers than can help you prevent heart disease and diabetes. Participants in the blood tests are reminded not to eat any food or drink other than water for 12 hours before attending the health fair. Participants are also reminded to drink lots of water only from the night before and in the morning of the fair. Basic screening that have a much-reduced cost include: blood chemistry screening (blood draw costs $35); blood cell count ($20); PSA—for men only ($30); colon cancer screening kit ($25); and Vitamin D 25-Hydroxy Screening ($45 for the blood draw). Payments for these services may be made by check, written to the 9Health Fair. Other tests without cost are: height/weight/body mass index; vision; and pulse and blood pressure screening. After you do your testing, a good healthy breakfast will be served free of cost by the Meeker Lions Club. 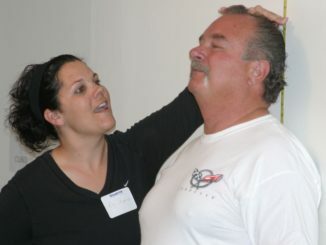 Amy Thayer measures the height of Rick Bishop, one of the 710 people who went through the 9Health Fair on Saturday at the Fairfield Center in Meeker.